Happy Holi to all of you ! 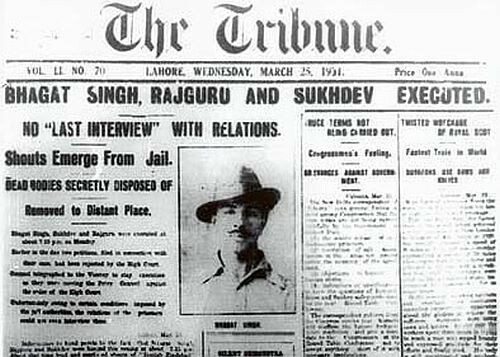 Our Salute to the Great Martyrs ! They were the great martyrs, who were hanged to death as they fought for the freedom of our mother land. Strange are the ways of our present time politicians, who compare these martyrs with any short term player, who want to gain publicity by whatever way possible. Strange are the ways of our present time politicians, who for their own benefit, are boosting such characters, beyond any limits. Support Earth Hour - Save Electricity - Go Solar ! Labels: Support Earth Hour - Save Electricity - Go Solar ! क्यों हम लोग खुशी मे पिछड़ते जा रहे हैं ? हैरानगी हुई कि खुशी के मामले मे भारत अपने पिछले पायदान से गिर कर 118वें नंबर पे पहुँच गया. और तो और हमारे सारे पड़ोसी, खुशी के मामले मे हमारे से ऊपर नज़र आए. तो क्या कारण है कि सब कुछ होने के बाद भी, हम लोग खुशी के मामले मे नीचे जा रहे है ? कहीं इसका कारण हरयाणा के रिज़र्वेशन के दंगे तो नही जिसमे 34,000 करोड़ का स्वाहा हो गया. जिसमे मुर्थल मे, महिलाओं को कारों से निकाल कर बलात्कार किए गए. या फिर इसका कारण JNU के वो नारे तो नहीं जिन्होने सारे भारत को हिला कर रख दिया. एक बारगी तो विश्वास ही नही हो सका कि कैसे, अपने ही देश के लोग, अपने ही बच्चे, अपने ही देश की बर्बादी के नारे लगा सकते हैं. कहीं इसका कारण यह तो नही कि वो लोग जो इस देश मे रहते हैं, बड़े ओहदों तक भी पहुँचते हैं, लेकिन भारत माता की जय कहने मे हिचकिचाते हैं और इसको एक बहेस का मुद्दा बना देते हैं. या फिर इसका कारण यह भी हो सकता है कि दुनिया भर मे पेट्रोल के दाम घटने के बाद भी, क्यों हमारे देश मे पेट्रोल, डीजल, के दाम बड़ जाते हैं. सभी जानते हैं की जब चिदंबरम साहिब ने दिल्ली मे MTNL पर 2% का सर्विस टॅक्स लगाया था, तो किसी को यह खबर नही थी कि कुछ ही सालों के बाद वो लगभग हर ज़रूरी चीज़ पे 15% की दर तक पहुँच जाएगा. शायद यही डर देश के सुनारों को भी सता रहा है जिनपर 1% की एक्साइस ड्यूटी थोप दी गई है. शायद दालों के बड़ते दाम, प्रॉपर्टी के घटते दाम, बे -मौसम की बरसातें, किसानो की ख़ुदकुशी, नेताओं की बे फ़िजूल की बहसे, देश का एक अच्छा ग्रोथ रेट दिखाने के बाद भी, देश की खुशी का कारण नही बन सका है और शायद इसी कारण हम लोग खुशी मे पिछड़ते जा रहे हैं. इसके कारण ढूँदने निकलेंगे तो यकीन मानिए, जाने कितने पेज काले हो जाएँगे. लेकिन अब देखना तो यह है कि क्या उसके बाद भी, हम लोग, सच मे, खुश रहने के कारण को ढूंड पाएँगे ? A gazette notification by Ministry of Health and Family Welfare has banned 344 medicines of fixed drug combinations. The Health Ministry banned 344 fixed drug combinations through a gazette notification. The ban, which comes into effect immediately, follows recommendations of an expert committee formed to examine the efficacy of these drug combinations. with thanks : Mr Vinay Kapoor : Details must be verified from the original source i.e. Ministry of Health & Social Welfare. LINK above : Medinews. We refer to news reports in the Hindustan times dated 9th March 2016 regarding your statements as reported on the matter of power tariff hike and CAG audit of DISCOMS. 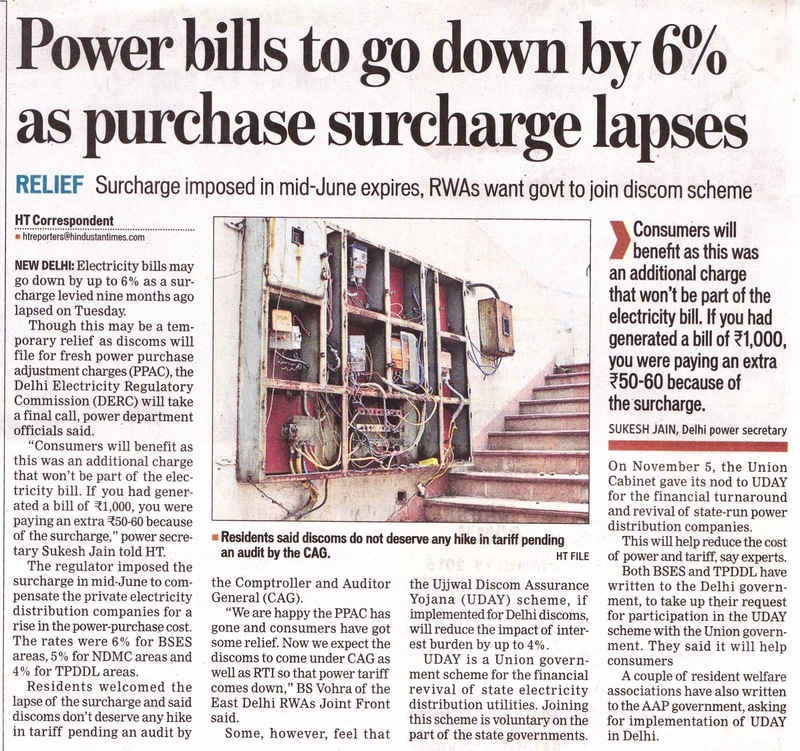 Since URJA has been the frontrunner and the first body to raise the matter of power tariffs we consider it important to let the public at large and all RWA to be aware of the factual position in this matter as political statements, even inadvertently made can be seriously misleading. We believe that systemic faults should be rectified through following due process honestly rather than through political theatre & browbeating. URJA & Power Experts help organise, educate and escalate the lawful filing of objections each year against the Tariff petitions filed by DISCOMs before DERC. · The demand for a CAG audit has been persistently raised by URJA and all RWA since 2005. URJA led a padyatra to 70 MLAs in the congress Government demanding a CAG audit which was ordered by the then cabinet in principle. · It was URJA in 2011 that took the matter to the hon’ble HC and the GNCTD only followed suit. The current matter of appeal against the Hon’ble HC judgment was also first filed in 2015 by URJA in the Hon’ble SC and once again the GNCTD only followed it in 2016. We hope you will continue to push for systemic reforms in the power sector as well as maintain the integrity of institutions. Happy Women's Day : Best wishes !